I suspect that the internet will blow up in the next couple of hours. Won't someone please thing of the children!!! Hordes of Chaos march again. No-one can deny that you can make some excellently fluffy lists from this, with Greater Daemons leading a legion of their mortal followers in the service of their dark god. But given that Warhammer is a blood-sport, no-one can deny there'll be Throgg and his Trolls hanging out with a Doombull with Blackened Plate, with double Skullcannons and a Hellcannon in direct support. The issue isn't that the three Chaos books are together, it's that you can now fine-tune a list across three army books. I think it will only be a problem for those army books that don't get the same option to borrow from another book. I imagine that a Dwarves/Empire/High Elf combo would be just as filthy. If Orcs or Ogres or Skaven don't get to form a legion with another book or two, they'll be in a very weak position. I think it's going to be OK once the dust settles, as long as a new equilibrium establishes itself, rather than the last days of 7th Ed where some books were clearly superior to the others. Pestigors are back....that is all! 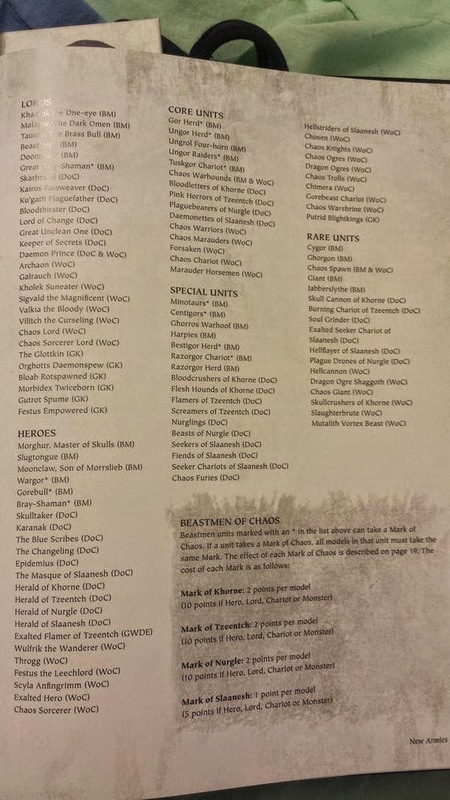 That ain't the half of it... "Chaos Ascendant" for unbreakable mono-god armies that DON'T have any form of instability. Because mono-god is indeed fluffy. Pretty sure chaos ascendant is only used in the new scenarios in the book. What is Good In Life? Vampire Counts - Who's On First?